The thought of going on a seven-day detox diet can be incredibly daunting. With so many different diets touted online and in books, it’s tough to tell which approach is right for you. And as do-it-yourself detox becomes more and more trendy, it’s all too easy to lose sight of the purpose of cleansing: focusing on whole, unprocessed foods that nurture your body and lighten your toxic load. 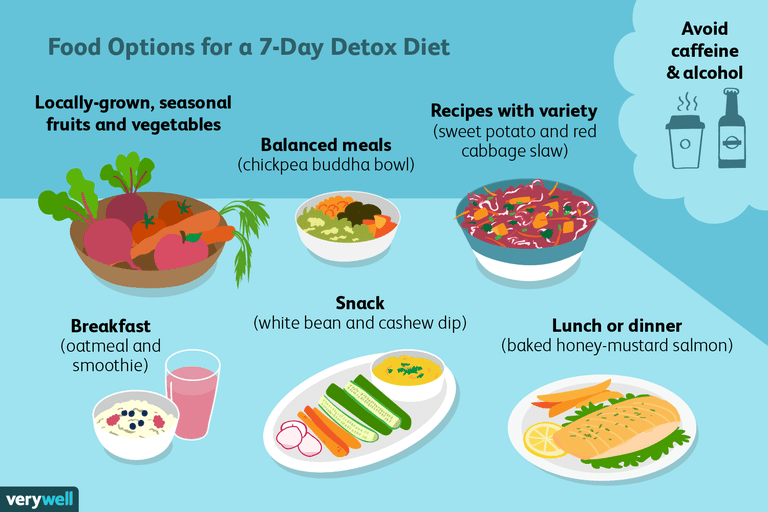 A seven-day detox diet can be helpful if you use it as a way to begin a healthy way forward when it comes to your eating. But embarking on one every now and again to "right" eating and drinking "wrongs" is not a healthy approach. For a smarter approach to a detox diet, forget the latest fads that can lead to unhealthy eating patterns and follow a more sensible plan that encourages you to get back to healthy-eating basics and make a long-lasting impact on your wellbeing. From the preparation stages to your post-detox diet, we’ve got you covered on the healthiest and most effective way to cleanse. To stave off common detox reactions such as headache and nausea, try phasing out caffeine, sugar, processed foods, and artificial sweeteners in the days leading up to your detox diet. If you’re not ready to give up caffeine altogether, switch to lower-caffeine drinks like green tea, white tea, or matcha. In the preparation stages, you should also aim to plan your meals for the week. With your eating plan carefully mapped out, you’ll be less likely to stray from your detox diet. You may also want to take this time to rid your kitchen of any foods or beverages that might tempt you during your cleanse. If you work during the week, it’s a good idea to begin your detox on a Friday. This approach allows for more downtime during the first few days of your diet, which are usually the most difficult. There are no hard and fast rules as to what you should include in your week-long detox diet. However, your goal should be to focus on antioxidant-packed cleansing vegetables and fruits along with high-fiber foods like whole grains, nuts, and seeds. As you build your diet around these foods, make sure to eat in moderation. Eat locally-grown, seasonal fruits and vegetables. Try a salad with seasonal vegetables, whole fruit, smoothies, juices (such as beet, carrot, apple and ginger juice or green juice). Enjoy balanced meals. Each meal should ideally include some protein, healthy fat, high-fiber, whole grain carbs, and fruits and vegetables. For inspiration, search our expert-created recipes found here on Verywell for gems like Red Curry Lentil Soup With Kale or Chickpea Buddha Bowl. Opt for recipes with variety. Try to get a variety of vegetables on your plate, such as dark leafy greens, beets, artichokes, onions, carrots, and cucumbers. Add cooked chickpeas, avocado, brown rice, baked sweet potato, hemp seeds, extra-virgin olive oil, and other foods rich in protein, fiber, and fat. Better yet, look for recipes that combine a variety of plant-based ingredients like Sweet Potato and Red Cabbage Slaw. Breakfast. If you tend to eat the same thing for breakfast, try oatmeal, a smoothie, fresh berries, a breakfast bowl, or chia pudding. Snack. Some snack ideas include White Bean and Cashew Dip or Roasted Red Beet Hummus with vegetables or Cumin-Lime Roasted Chickpeas. Lunch or dinner. A perfect meal might include a portobello mushroom cap brushed with olive oil and baked, Butternut Squash Soup, One-pot Vegan Chili, Curried Chickpeas, Baked Honey-Mustard Salmon, or Black Bean Arugula Tostadas. Throughout your seven-day detox diet you should steer clear of processed foods and any foods with added sugar, as well as dairy and wheat. Caffeine is also off-limits, as well as some specific foods in the meat and condiments categories. Avoid alcoholic drinks (such as wine, beer, and spirits) during the cleanse. Alcohol is metabolized in the body mainly by the liver. It is broken down briefly to acetaldehyde, a chemical that has the potential to damage liver cells and body tissues, before it is further broken down and eliminated from the body. Besides lightening the load on your liver, avoiding alcohol (and caffeine) for the week can help to shift habits you've cultivated. Drinking plenty of water can go a long way in flushing out toxins. While you’re on your detox diet, aim to drink eight glasses of filtered water daily. That includes a glass of water (ideally room-temperature or lukewarm) as soon as you wake up in the morning. A helpful hint: opting for lemon water or a DIY infused water may enhance the detoxing effects of your morning hydration. Some people may need more fluids, and some people may need less. Although you can use your thirst as a guide, you may want to consult your health professional about the appropriate fluid intake for you. Physical activity boosts circulation and, in turn, helps your body to eliminate toxins. To rev up your circulation during your detox diet, make sure to include light exercise in your daily routine. You might try going for a walk during your lunch break, for instance, or taking part in a restorative yoga class. Since your energy may lag during the first few days of your detox diet, it might be helpful to break up your exercise sessions into short intervals. If you don’t exercise regularly, talk with your doctor before starting an exercise regimen. A detox diet isn’t about depriving yourself of certain foods or activities—it’s about taking better care of your body and mind so that you can feel great in the everyday. Try using this time to strengthen your self-care, such as by improving your sleep routine and treating yourself to a massage (a therapy thought to promote the release of toxins). Your seven-day detox diet is also a perfect opportunity to try out new stress-management techniques. To alleviate daily stress and find your way to greater calm, try practicing deep breathing, progressive muscle relaxation, mindfulness meditation, or yoga. Even simple strategies like listening to music, going for a leisurely walk, soaking in the tub, or curling up with a favorite book can help soothe your mind. If you’re not used to eating a lot of fiber, it may take a few days for your body to adjust to the high-fiber content of a detox diet. To stimulate your digestive system, try sipping herbal tea (such as ginger tea, peppermint tea, caraway tea, or cinnamon tea). If your seven-day detox diet is particularly rich in beans, try adding a piece of kombu seaweed to your soaking water when preparing dried beans. Keep in mind that by day four or day five of a detox diet, many people begin to feel more energetic and notice that their digestion is improving. As you journey through your detox diet, you’ll likely find that simple changes such as drinking more fluids or eating more vegetables can have a profound effect on your daily wellbeing. In fact, it’s thought that the 7-day approach is an ideal way to experiment with a broad variety of new foods, recipes, and lifestyle habits. To build on that momentum, ease back into a less restrictive diet while adopting new behaviors (such as eating three servings of vegetables at lunch and dinner). Don’t try to make too many changes all at once. Research shows that people form healthy habits more easily when attempting to take on simple actions (such as drinking more water) rather than striving to adopt elaborate routines. Research indicates that healthy habits can take up to six weeks to become ingrained—and that treating yourself to small rewards can help motivate you to stick with those positive changes. Proponents of detox diets often recommend cleansing several times a year to improve your health and prevent disease. When repeating your detox, try integrating different eating patterns and actions than you did on your last diet. Testing out new wellness strategies during your seven-day detox diet can give you powerful clues on how to achieve optimal health all year round. A seven-day detox diet isn’t appropriate for all people. If you have a chronic health condition such as liver disease, diabetes, cancer, kidney disease, or an eating disorder, it’s crucial to consult your doctor before modifying your diet. If you have any concerns about making changes to your dietary regimen, talk to your physician to determine whether a seven-day detox diet is right for you. Looking to lose weight? Our nutrition guide can help you get on the right track. Sign up and get yours! Gardner B, Lally P, Wardle J. Making health habitual: the psychology of “habit-formation” and general practice. The British Journal of General Practice. 2012;62(605):664-666. Gardner B, Sheals K, Wardle J, McGowan L. Putting habit into practice, and practice into habit: a process evaluation and exploration of the acceptability of a habit-based dietary behaviour change intervention. Int J Behav Nutr Phys Act. 2014 Oct 30;11:135. Wood, W, Neal, DT. Healthy through habit: Interventions for initiating and maintaining health behavior change. Behavioral Science and Policy. Volume 2, Issue 1, 2016. pp. 71-83. Are Detox Diets Effective and Safe? Is Weight Watchers the Best Diet Plan for You? Does the Purium 10-Day Celebrity Transformation Work?